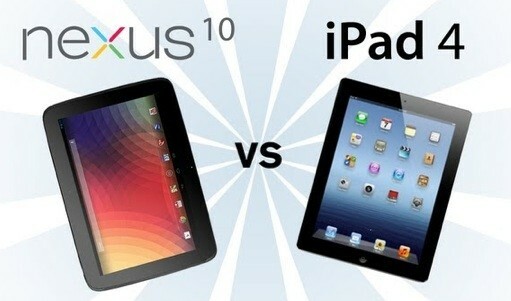 We revive old rivalries as we compare Google Nexus 10 to Apple's new iPad 4. Dimensions & Weight:Google Nexus 10 have 263.8 x 177.8 x 8.9 mm and its weight around 603 grams while iPad 4 carries a dimension of 241.2 x 185.7 x 9.4 mm and weighs in at 652 grams. Display: Google Nexus 10 have a 10.1 inch display with a resolution of 2560 x 1600 pixels and 300 ppi pixel density. In comparison, iPad 4 with the Retina Display technology ,features a relatively smaller 9.7 inch LED-backlit Multi-Touch display with IPS technology with 2048 x 1536 pixel resolution. Processor: According to Goggle nexux has 1.7GHz Cortex A15 dual-core processor while iPad 4 uses the Apple A6X processor that is twice as fast A5X processor in the new iPad 4. Operating System: While Nexus 10 is based on Android 4.2 Jelly Bean and iPad is based on iOS 6 operating system. When it comes to software features, Android 4.2 comes with new features including Gesture typing - predictive typing, Photo Sphere - to create panoramic shots, support for wireless displays(WIFI), multi-user support , Daydream to display useful information, improved Google Now and lock screen UI improvements. At the same time, iOS 6 comes with 200 new features including improved Siri,updated Apple Maps , Latest Safari browser, iCloud cloud storage, integration to Facebook, new PassBook app, PhotoStream app and more useful apps. Camera: The google Nexus comes with 5 megapixel camera and ipad also has 5mp camera but, iPad 4 employs iSight camera technology. When it comes to front camera, Nexus 10 has a 1.9MP camera and iPad 4 has a 1.2MP FaceTime HD camera for video calling. Storage: This is one of the key areas and here Nexus 10 comes with 16GB/32GB internal storage memory, whereas iPad 4 comes with 16GB, 32GB and 64GB internal storage memory. Moreover, there are rumors stating that iPad Mini will also retail in 8GB version. Further, Nexus 10 has a 2GB RAM and iPad 4 comes with a 512MB . Connectivity: This is where Nexus 10 comes with connectivity features including Bluetooth, Wi-Fi, micro USB, micro HDMI, dual side NFC and GPS+Glonass, iPad 4 has everything else including Lightning port , Wi-Fi and Bluetooth connectivity options. Battery: Nexus 4 has a 9000 mAh Li-ion battery offering close to 9 hours of active usage and 500 hours standby, almost a full day of moderate usage with calling, gaming etc thrown in.On the other hand, iPad 4 is loaded with a 42.5 Whr Li-ion battery, both offering about 10 hours of backup. Price: In terms of pricing, iPad 4 will be priced at Rs 21900 and Rs 31900 for the starting models. whereas, Nexus 10 is available online for a price of Rs 32,850. Verdict Both Nexus 10 and iPad 4 are high-end tablets with advanced features and specs. Moreover, they are loaded with different operating systems and hence, they will offer distinguished user experience. However, if the concern is on a slightly larger display, faster processor, better front camera and NFC connectivity, Nexus 10 is a right choice. On the other hand, if increased internal storage options, better battery backup and iSight camera performance are the main concern, iPad 4 could be the better option. Finally, the buying decision depends on the operating system that the user wants to work on - Android or iOS.